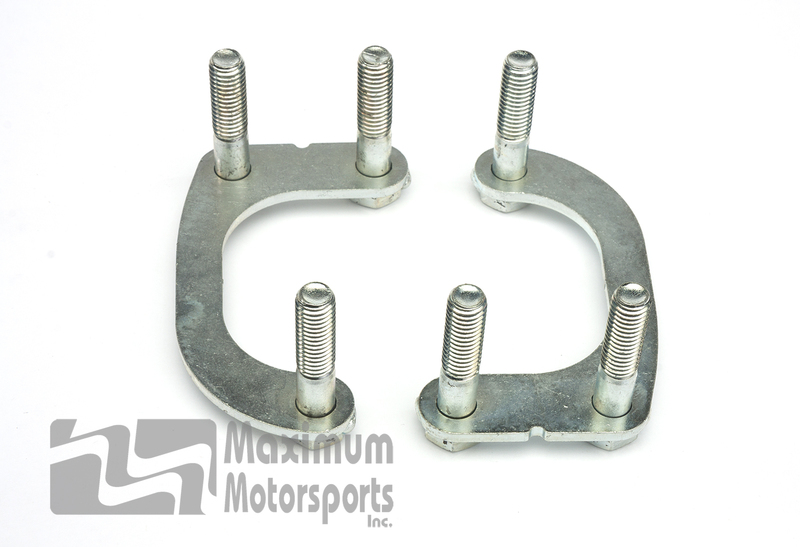 Maximum Motorsports 1990-93 Mustang Caster Camber Plates provide the means to properly align your Mustang's front tires. Especially well-suited for lowered Mustangs because MM's innovative design provides a much wider range of adjustment for camber than the stock adjustment slots. Strong enough to support a coil-over conversion. Lowering your Mustang will cause the top of the front tires to "lean in" towards the center of the car (increased negative camber), resulting in uneven tire wear. This excessive negative camber can be easily corrected with the Maximum Motorsports Caster Camber Plates, allowing alignment to factory specifications. Lowering your Mustang also results in a reduction of bump travel, which will degrade ride quality. Installation of Maximum Motorsports Caster Camber plates restores most of the lost bump travel. MM Caster Camber Plates provide the means to adjust the front alignment for improved performance. The wider range of camber adjustment allows the reduction of excessive negative camber caused by lowering. That will improve tire wear of a street-driven Mustang. Camber may be adjusted to a much more negative setting for more front grip when cornering. 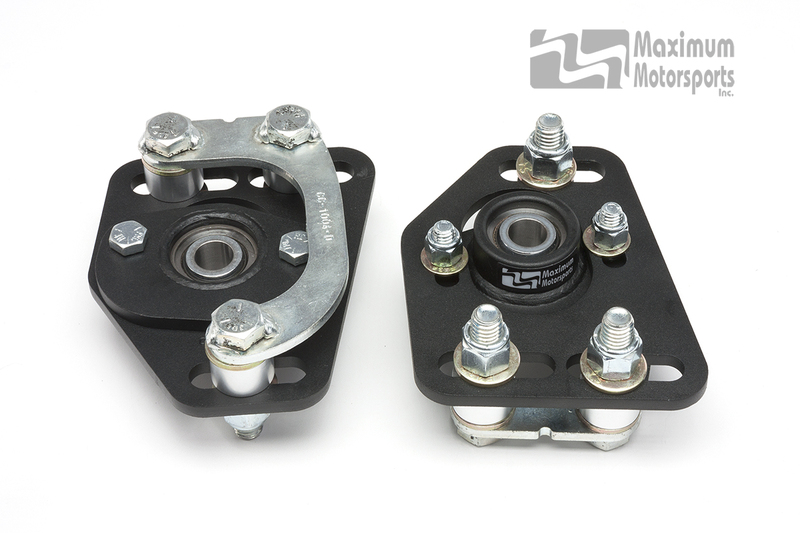 MM Caster Camber Plates provide adjustment of caster, which is otherwise not adjustable. Increasing the amount of positive caster improves straight-line stability. Increasing the amount of caster also helps increase front grip during cornering because additional cater causes an increase in negative camber on the outside tire when the car is steered into a corner. The increased negative camber increases cornering grip. The increase in negative camber is only present while the tire is steered, and therefore does not harm tire wear. Main plate is laser-cut from high-grade alloy steel, not mild steel. The increased strength greatly reduces the possibility of bending. MM-designed spherical bearing is custom made in the U.S.A.
Chrome finish on the main plate is optional. Do your own alignment with an MM Camber Gauge. Provides a wider range of camber adjustment than is allowed by the stock camber adjustment slots. Provides caster adjustment (otherwise not adjustable). Allows greatly increasing caster for improved straight-line stability and improved cornering ability. Designed to support a coil-over conversion. Double-adjustable. Both camber and caster can be adjusted independently; adjusting one does not affect the other adjustment. Separate and independent adjustment for camber and caster. Widest possible range of camber adjustment, twice the range of the stock slots and upper strut mount. Strut shaft can be moved from one side of the strut tower's center hole to the other side. Widest possible continuous range of caster adjustment, limited not by the plate, but by the strut shaft contacting the rear edge of the strut tower's center hole. PTFE lined spherical bearing was designed by MM, and is custom manufactured in the U.S.A. Spherical bearing allows proper articulation, unlike urethane-bushed camber plates. Main plate is a high-grade alloy steel that is much stronger than mild steel, and has a much longer fatigue life than aluminum. 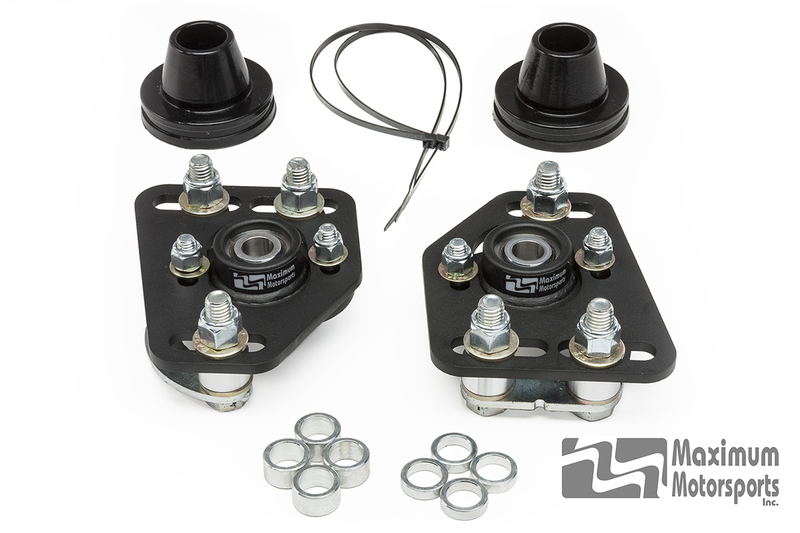 Includes progressive-rate bumpstops (for use with struts other than MM and Bilstein). 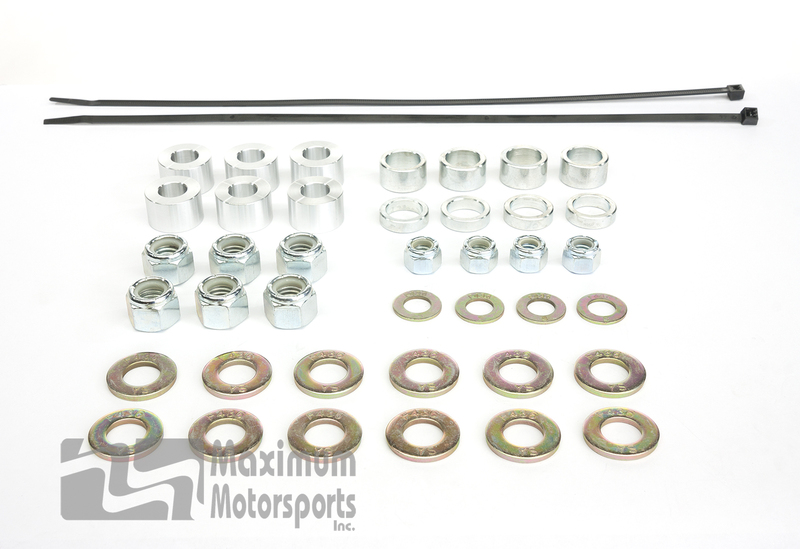 Retains stock strut dustcovers in applications using struts other than MM and Bilstein. Chrome main plate is optional. Designed and manufactured in the U.S.A. by Maximum Motorsports. Raceland brand coil-over struts, because they were designed to only fit the stock upper strut mount. Any other Fox chassis not listed above (including 1979-1989 Mustang, 1983-1988 Thunderbird, 1984-1992 Lincoln Mark VII, 1978-1983 Fairmont/Zephyr, 1983-1986 LTD/Marquis) because of differences in the pattern of slots and holes in the strut towers. The design of the Strange strut causes very audible noise when the suspension moves. Many people assume the noise is caused by camber plates because they did not notice the noise when they had the stock upper strut mount installed along with their Strange struts. That assumption is incorrect. MM Caster Camber Plates do not make noise when in good working condition; they only make noise if the spherical bearing has been damaged. However, the spherical bearing does transmit noise more easily than does the stock rubber-bushed upper strut mount. Strange struts make noise from the internal workings of the valve, and MM caster camber Plates will transmit that noise into the car. The noise is caused by the Strange struts, not the camber plates. Going with coil-overs? The MMCO-2 front coil-over conversion kit fits Strange struts. 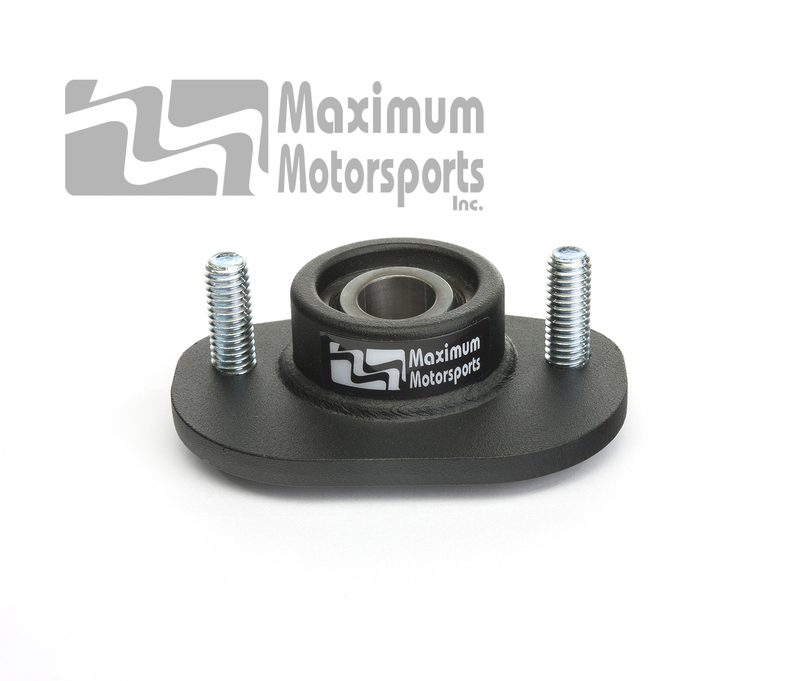 Maximum Motorsports Caster Camber Plate FAQs are compiled on a separate page. If you have a question that is not answered on the FAQ page, please use our Contact Us page to email your question to us. We will answer your question by return email, and also consider your question for possible addition to our FAQs. 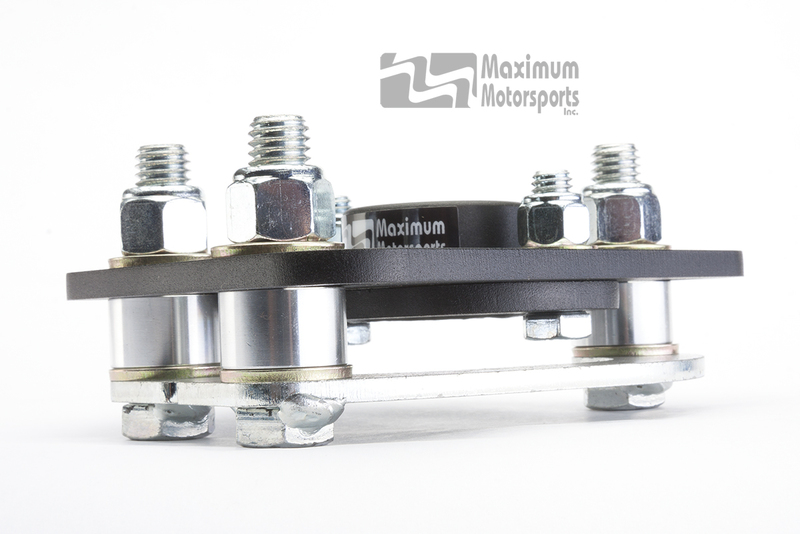 You can read Maximum Motorsports' highly detailed MMCC9093 Caster Camber Plate installation instructions before purchase. 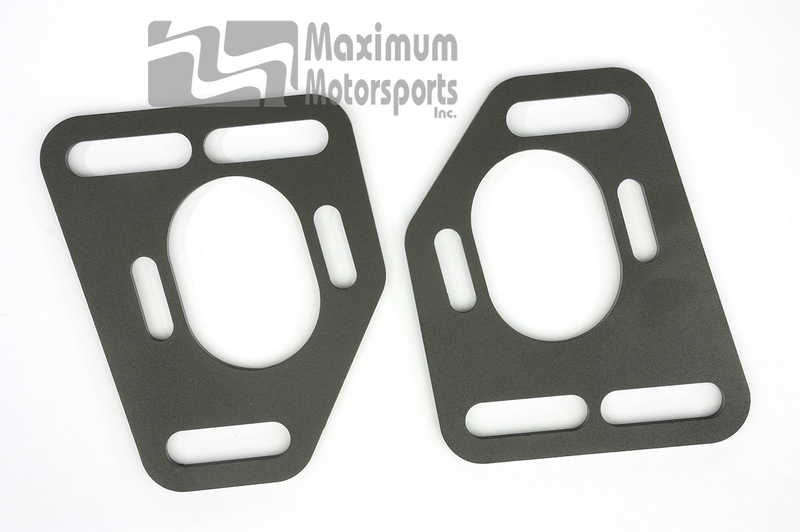 Maximum Motorsports provides a limited warranty to the original purchaser of MM Caster Camber Plates. If any of the covered items fail in use, we will replace that component. This is not a warranty against items wearing out from use, but is a warranty for the failure of any of the specific components listed. 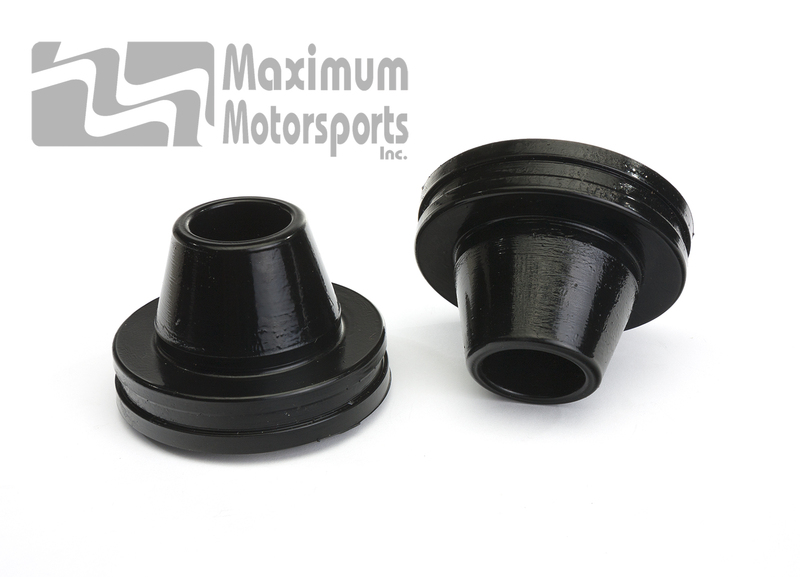 This warranty applies only to the original retail purchaser of genuine Maximum Motorsports (MM) Caster Camber Plates. Caster Camber Plate Warranty: List of covered items and items not covered. How to submit a warranty claim.